Clear transparent self-adhesive polyester film with specially formulated high-resolution coatings that give brilliant colours and exceptionally high-resolution prints on inkjet printers. 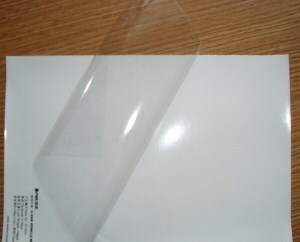 Perfect thickness of this film together with its backing sheet and adhesives guarantees easy feeding. High quality adhesives are colourless and not yellowing. When stuck to a surface it will become a permanent fixture. Excellent for production of badges. This product is compatible with all ink jet and bubble jet printers including: H.P., Epson, Canon, Lexmark, etc. For dye, pigmented, ultrachrome, K3 and vivera inks.